This month’s Gift Izzy theme was “Out of Africa” which I love and think is so unique. This gorgeous necklace is designed by South African jewelry designer Louise Serafini exclusively for Gift Izzy. It’s sterling silver and is actually two separate necklaces that can be worn together as shown for a beautiful layered look or separately. Louise says that she based the necklace design on the “elements of water, air, fire, earth and spirit, and the delicate balance of all these that bring and sustain life in Africa.” The shorter pendant is the iconic Tree of Life. The second pendant which is long and skinny is called Spirit and is a pendulum shape. I love these necklaces and think they are beautiful. I think I’ll wear them together as I prefer them that way. I love that they are exclusive to Gift Izzy and can’t be purchased anywhere else. This is how they fall on me when worn together. These tea sachets are naturally caffeine free and called “rooibos” or Red Bush tea. It’s commonly consumed in South Africa and contains numerous antioxidants. The smell of the sachets is reminiscent of hibiscus tea. I love the cute tin though I struggled to open it until my husband pointed out the directions on the bottom instruct you to press down on the center of the lid and then it popped right off! WASS Skin is a small-batch company based in Cape Town South Africa. The lip balm is made with natural ingredients and no petroleum, parabens, or dyes or synthetic fragrances. The ingredients are only olive oil, beeswax, coconut oil, rosehip oil and rose geranium. I found it be very herbal smelling and highly addictive. I love how it feels on my lips and I can’t stop applying it throughout the day. Beaded Elephant Luggage Tag – $15.00? I adore this elephant luggage tag! I can’t wait to take another trip so I can show it off on my suitcase. These elephants are hand beaded by Delico Ngwenya from Johannesburg, South Africa and each one takes two hours to make. Proceeds from the luggage tags go towards purchasing food, clothing and shoes for local South African children. I wish there was a way to purchase more of these for gifts. I think it’s beautiful! Verdict: I am thrilled with my Gift Izzy box this month. The value is about $257 which I think is outstanding. I adore the hero item (necklace) and thought all the other items were fabulous as well. I think Gift Izzy does a great job of putting quality over quantity. They seem to follow a very successful formula each month of a high end fashion accessory, a beauty item, a food item and one item for home. One of the things I love about Gift Izzy is that each item they send could be a gift in itself if it was something you chose not to keep for yourself. I also love Gift Izzy’s packaging and themed curation. This is my favorite women’s lifestyle subscription. Harneys Tea is made in America (CT I believe) and not in Europe. Unfortunately they do not ship to Canada…. I was so excited when one of the commenters said they did – nope. Wrong. 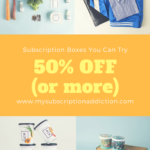 I LOVE this subscription box! I am never disappointed with the items. I have contacted their customer service and they were excellent. I wish that I had discovered them before committing to Box of Style or Oui Please – two high priced boxes that have been disappointments for me. Keep up the wonderful work! Because I’ve been trying to be good and cut back on unnecessary purchases, I’ve been resisting the temptation to read reviews here as much. So I was late in seeing this box. But after reading previous reviews, I was thrilled to see you can still purchase single boxes on their website! The one from Apri/May with the Badura clutch is gorgeous! Their customer service is excellent. I received a very quick response and they even allowed me to request which color of clutch I preferred! Despite those who might not agree to certain individual item values, the overall value of this box for the price is indisputable. FYI, the MSA10 code for 10% off is also still working. After purchasing a single box, I couldn’t resist also starting a subscription. Can’t wait for the next box! Ok, I’m really not trying to be a b*tch here but that necklace should not be anywhere near that price. The tree of life one can be bought on Amazon for less than twenty dollars. The other has about $30 of materials and that’s being generous. The price for both pieces should be around the $60 range. I’ve had several MSA subbers recommend this box to me so I’m going for the single box and deciding from there. My OuiPlease and LuxeProvence subscriptions are up and I’m not resubscribing to either right now (can’t afford it and I’m definitely over OuiPlease). I’m swimming in beauty/skincare items so I’m taking a break from everything except BeautyFix. This Gift Izzy box has items that I can see myself actually using! I don’t know if I’ll be getting this box or I’ll have to wait until the next round. Another amazing box from Gift Izzy. Their hero items are always amazing and I like how the hero item is a huge part of the box as it is better quality stuff. I’m just going to sign up at this point as they have consistently had amazing boxes. I’ve been more and more disappointed with popsugar and box of style lately and am dropping them to just sub to this, adidas, and my fair trade boxes. I like how these boxes also give back to underprivileged countries and yet also have better quality items than the majority of the boxes out there. Keep it up Gift Izzy! Thanks for the link! They have a large assortment of animal beaded tags. They aren’t expensive and are fair trade! Cool! I love the chameleon! This box is very lovely. I love everything in the box. Wish I could afford! How lovely – this seems like a higher end priced box that is actually worth it. You get a nice variety of items, and all of these look great! Yes, it’s such a nice treat-yourself box! I love Gift Izzy. I used to do Box of Style and many times was disappointed. With every Gift Izzy I am happy and never have buyers remorse. They charge my card and a week later I have the box, none of the waiting associated with other subs. This was my 3rd box and I will keep going! I love how the bracelet from the last box is also silver and on Saturday I wore it with my new necklaces and carried my clutch, I felt so special and got tons of compliments. Love it! I love the elephant tag, I wish you could buy them!! Boxes are still available! ? I love all of these items! If I subscribed now, I would still receive this box first? Yes, this box is still available. If you want to be 100% certain I would check with their customer service, but on their website it shows they still have boxes available. Good luck! Yes if you sign up now, you will receive the Aug/Sept box themed South Africa Safari. This is my favorite box. I dropped a bunch of other subs for it and I don’t regret a thing! I am obsessed with that necklace, so much so that I feel I may wear it out! Lol…the only risk is that all the value lies in the hero item but so far I haven’t been disappointed! This is an AMAZING box! I wish I had subscribed to it this month 🙁 I would love to swap for that luggage tag if anyone is open to it! It is a bimonthly sub you can still get this box, I ordered Friday. It’s nice to finally see silver jewelry in a subscription box. While I like gold for décor purposes, I hate wearing gold jewelry and it seems like it’s all anyone sends. It’s a lovely piece on top of that. The curation of this is also lovely. It’s almost as if you went to Africa and got these items from vendors on the street. I felt the same way, almost like I got to visit Africa through these beautiful items!